“Padawan Zayne Carrick has come to confront the Jedi who framed him for the murder of his fellow students. 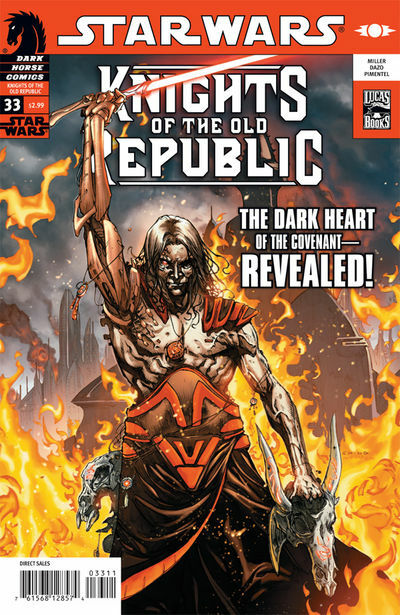 Yet he and his former Masters are shocked by an unforeseen revelation–another failed Padawan, believed to be a devoted servant, unveils his own dark intentions! Here’s why this issue was not good. The first reason was that the story, I feel, was nothing more than filler. We’ve spent 33 issues with the same umbrella story that is finally coming to a head and this issue is background filler on a villain. Is the guy in the dark robes, with cybernetic appendages, and ominous presence a Sith? OF COURSE HE FREAKING IS!! Did I need to spend an extra $2.99 for his background story? No, I can just accept that he’s our real bad guy, the puppet master, the mastermind. Honestly, John Jackson Miller has delivered in every issue I’ve ever read of his. This one just really put the brakes on a story that have been going full speed ahead for the last 4 issues. The second reason is one that has been plaguing KOTOR for a long time. This book can’t seem to keep a decent artist on board for more than one issue. Brian Ching was the KOTOR artist for some time and really had a great grasp for the material and the look that fans wanted. He has been on-again-off-again for what seems like a year, and now we have Bong Dazo. I’m sure he’s a competent artist in many areas, but he’s not what KOTOR fans are looking for. If I wanted a cartoony Star Wars, I’d read Tag & Bink. I’m hoping we get some kind of explanation from Dark Horse or John Jackson Miller on just what the heck is going on.